Telecom Regulatory Authority of India (TRAI) has announced report on Broadband base subscribers as on July, 2012. The latest report revealed that, India total Broadband subscribers base has hiked from 14.50 million to 14.68 at the end of July, 2012 month @1.20% growth rate. 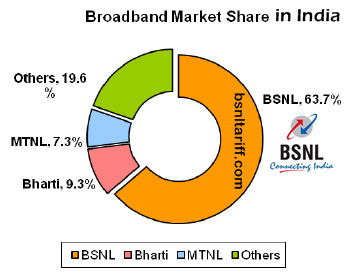 Only Bharat Sanchar Nigam Limited (BSNL) is leading and maintained its top position for providing Braodband connections to 9.36 million subscribers with 63.7% market share. BSNL is continuing its top position as Largest Internet Service Provider in India. Bharati Airtel occupied second place providing Broadband connections to 1.37 million subscribers with 9.3% market share. Mahanagar Telephone Nigam Limited (MTNL) operating its services in two circles (Mumbai/Delhi) providing connection to 1.08 million subscribers with 7.3% market share. Other Internet Service Providers (ISPs) like You Broadband and Hathway providing connections to 0.66 million and 0.37 million subscribers. Around 156 Internet Service Providers (ISPs) are providing Broadband services out this only 114 ISPs have provided data for the month of July,2012.